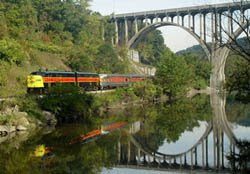 Back for the third year, the Cuyahoga Valley Scenic Railroad offers their Bike Aboard! program, which lets you Ride the Rail and Bike the Trail! You can take your bike on the train with you, then ride your bike on the Towpath Trail back to where you started! Please arrive at a boarding station 15 minutes prior to the train's scheduled arrival. The train can be flagged down at boarding stations by waving both arms over your head. Purchase your ticket when you board. One way between stations, once per day. $2 per person for ages 3 and up, includes your bicycle. This fee only applies to cyclists. Bike Aboard! is offered weekends only during the month of May. A new schedule of service Wednesdays through Sundays will be available beginning June 3.